As I have already reported, a Saudi journalist who was a Washington Post contributor, Jamal Khashoggi, went missing during a visit to the Saudi consulate in Istanbul. Turkish government investigators now believe he was killed inside the consulate. This sure smells like the dirty work of Saudi Crown Prince Mohammed bin Salman. Khashoggi had been writing negative essays about the Saudi government and about the Crown Prince in particular. Khashoggi had been in self-imposed exile from Saudi Arabia for the past year after leaving the country under what he said was fear of arrest. Salaman, known as MBS, who is considered violent, ruthless and a friend of Jared Kushner, was not happy with Khashoggi and his essays. MBS has spent millions with U.S. public relations firms to polish his image as a reformer (While bombing Yemen into the stone age, you see, he has let women drive). Mainstream media has been spreading the positive profile pumped out in living color by the PR firms about this maniac, until now. Killing a mainstream media contributor will change things. Confirmation of Saudi responsibility for Khashoggi’s disappearance could complicate efforts to get the alliance off the ground if Congress decides to punish Riyadh and public opinion in the United States demands a response. THREE GOVERNMENTS now bear inescapable responsibility to act on the disappearance of Jamal Khashoggi, the renowned Saudi journalist and commentator for The Post, who vanished after entering Saudi Arabia’s consulate in Istanbul last Tuesday. For more than a year, Mr. Khashoggi called attention in his columns to the increasingly authoritarian behavior of the Saudi crown prince, Mohammed bin Salman. 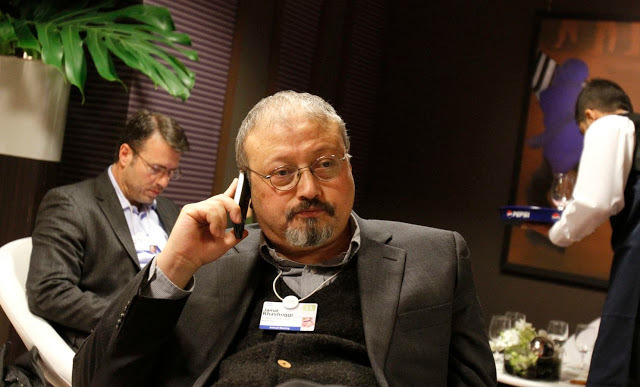 On Saturday, unnamed sources in Turkey said Turkish investigators believe that Mr. Khashoggi was murdered inside the consulate. The change may be the most visible sign yet of a modernizing Saudi Arabia, with reforms implemented by the heir apparent to the Saudi throne, Crown Prince Mohammed bin Salman...Ali al-Ahmed, director of the Institute of Gulf Affairs, a group often critical of the Saudi leadership, said the decision "shows the stamp" of the crown prince. The killing of a Washington Post contributor may be the dumbest thing MBS has done yet. President Trump said Monday that he is “concerned” about missing columnist and Saudi government critic Jamal Khashoggi, although U.S. officials have not issued a public demand for answers from ally Saudi Arabia. The president was asked about the case as he returned to the White House after a speech in Florida. If his death is confirmed, it would represent a new level of audacity in Saudi Arabia’s clampdown on dissent under Crown Prince Mohammed bin Salman. While painting himself as a reformer, Mohammed has shown himself to be ruthless in confronting any challenge to his power, jailing activists and dissenters.